You and your forefathers have devastated the balance of this world. And now, you shall pay the ultimate price! I recently finished watching the animated series “Avatar: the Last Airbender”. I know I’m a bit late with my praise, but I thought this was an excellent series. It had fascinating world-building, well thought-out plotting, and believable characterization. It had humor, drama, fantasy, even teen romance. Something for all ages! It could be because I’ve been thinking alot about the Four Elements and how I view them as analogies for the four relations I’ve been discussing for some time on this blog. 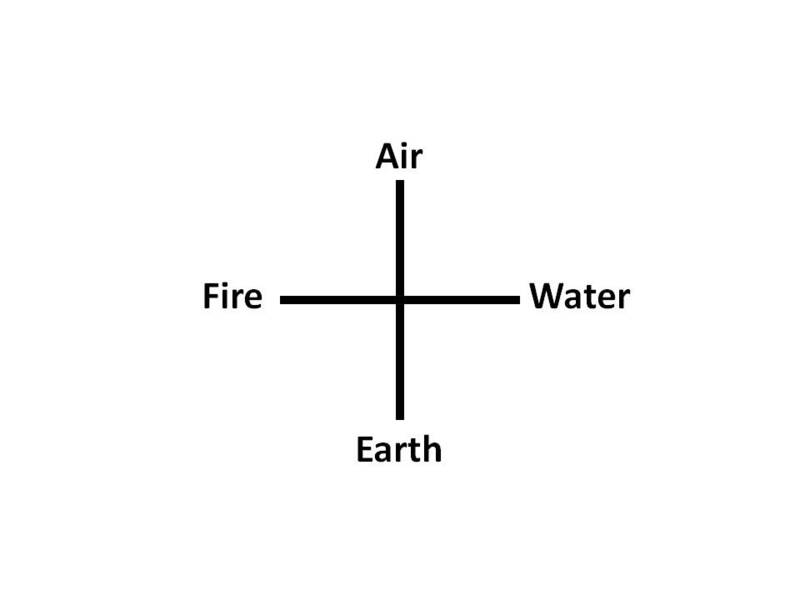 In Avatar, they are literally the four elements of the world: fire, earth, water, and air. But in addition, these elements correspond to the four peoples of this world. The people of the Fire Nation are willful, the people of the Earth Kingdom are resolute, the people of the Water Tribe are empathic, and the people of the Air Nomads are reflective. Some individuals are able to “bend” the element that is associated with the people they are born into, so that for example a member of the Fire Nation might be able to produce and control fire with thought and gesture. Not everyone has this ability, however. The Avatar is a continuously reincarnated individual that embodies the spirit of the world. He or she is born into each of the four peoples in a repeating cycle, but the Avatar is also the only individual that can learn to bend all four elements, and even all at the same time. Because of his or her unique powers, the Avatar is known to be able to bring and restore balance to the world, and to tie the real world to another, spiritual world. Avatar: the Last Airbender is the story of Aang, a descendent of the Air Nomads, but the last of his people due to genocide. He has been in a state of suspended animation for the last 100 years and awakes to a troubled world of war and turmoil. Can Aang save his world? Hopefully I’m not spoiling anything in saying that he does. Indeed a sequel is currently being produced called “The Legend of Korra” that is planned to run 52 episodes. This sequel takes place a number of years after the end of Avatar, and the next Avatar after Aang is Korra from the Southern Water Tribe. The world is now somewhat more advanced technologically than it was during Aang’s time, and although not at war because it is still enjoying the peace that Aang initiated, there is still some strife and unrest for Korra to eventually bring the Avatar’s balance to. I am enjoying it also! It is interesting to note that fire is the only element that can be generated by the will ex nihilo. With enough skill, water can be extracted from living matter and the air. Of course, air is ever present and earth is seldom far away. The probable discovery of the Higgs Boson was announced recently. I was initially confused about the difference between the Higgs and the yet to be discovered Graviton. After some reading on the internet, I’m still confused, but they are theorized to be two different particles, since the Graviton is the quantum manifestation of the force of gravity, and the Higgs is the quantum manifestation of the field that gives certain particles mass. 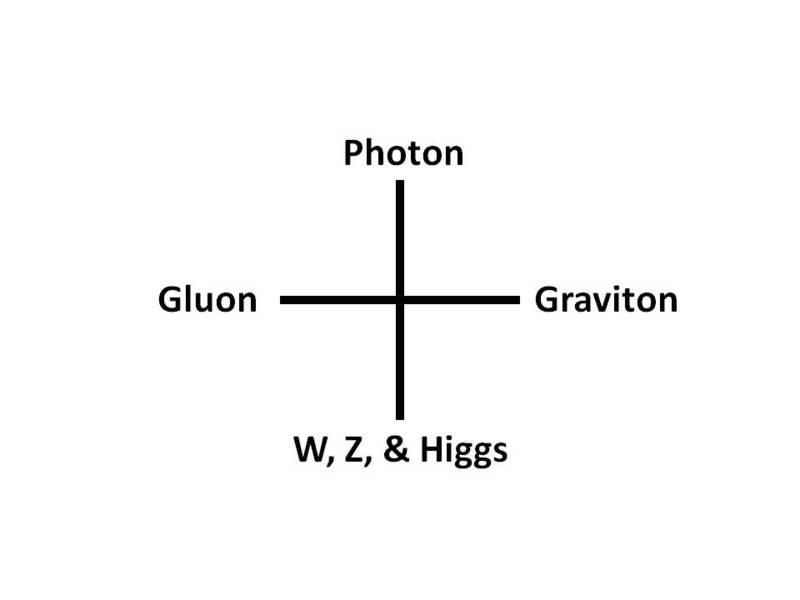 Since the Graviton can effect Photons, and the Higgs can’t, they must be different. You would think that since particles have to have mass to be effected by gravity, they would have to be related. I guess there are some theories out there that do that, but none have been validated. Additionally, the Higgs Boson is part of the Standard Model, and the Graviton isn’t, even though the Higgs doesn’t seem to fit nicely into those 4 x 4 matrices. The above fourfold is patterned after the Four Fundamental Forces of Physics. Aristotle’s Four Causes is an important fourfold that seems to be the basis for many of the fourfolds, both original and not, presented in this blog. Two of the causes, efficient and material, are acceptable to modern scientific inquiry because they can be thought of as motion and matter, respectively, but the other two causes, formal and final, are not. Why is that? The formal cause is problematic because the formal is usually considered to be an abstract concept, a construction of universals that may only exist in the human mind. The final cause is also problematic because it is associated with the concept of telos or purpose. There, too, only human or cognitive agents are allowed to have goals or ends. So for two causes, efficient and material, all things may participate in them, but for the two remaining, formal and final, only agents with minds may. These problems may be due to the pervasive influence of what the recent philosophical movement of Object Oriented Philosophy calls correlationism: ontology or the existence of things is limited to human knowledge of them, or epistemology. The Four Causes as usually described becomes restricted to the human creation and purpose of things. Heidegger’s Tool Analysis or Fourfold, which also appears to have been derived from the Four Causes, is usually explained in terms of the human use of human made things: bridges, hammers, pitchers. Even scientific knowledge is claimed to be just human knowledge, because only humans participate in the making of this knowledge as well as its usage. Graham Harman, one of the founders of Speculative Realism of which his Object Oriented Ontology is a result, has transformed Heidegger’s Fourfold so that it operates for all things, and so the correlationism that restricts ontology to human knowledge becomes a relationism that informs the ontology for all things. Instead of this limiting our knowledge even more, it is surprising what can be said about the relations between all things when every thing’s access is as limited as human access. However, this transformation is into the realm of the phenomenological, which is not easily accessible to rational inquiry. I wish to update the Four Causes, and claim that they can be recast into a completely naturalistic fourfold operating for all things. This new version was inspired by the Four Operators of Linear Logic. Structure and function are commonplace terms in scientific discourse, and I wish to replace formal and final causes with them. It may be argued that what is obtained can no longer be properly called the Four Causes, and that may indeed be correct. First, let us rename the efficient cause to be action, but not simply a motion that something can perform. I’m not concerned at the moment with whether the action is intentional or random, but it must not be wholly deterministic. Thus there are at least two alternatives to an action. I’m also not determining whether one alternative is better than the other, so there is no normative judgement. An action is such that something could have done something differently in the same situation. This is usually called external choice in Linear Logic (although it makes more sense to me to call it internal choice: please see silly link below). Second, let us call the material cause part, but not simply a piece of something. Instead of the material or substance that something is composed of, let us first consider the parts that constitute it. However, a part is not merely a piece that can be removed. A part is such that something different could be substituted for it in the same structure, but not by one’s choice. Like an action, I am not concerned whether one of the alternatives is better than the other, but only that the thing is still the thing regardless of the alternative. This is usually called internal choice. Next, we will relabel the formal cause to be structure, but not simply the structure of the thing under consideration. Ordinarily structure is not a mere list of parts, or a set of parts, or even a sum or integral of parts, but an ordered assembly of parts that shapes a form. 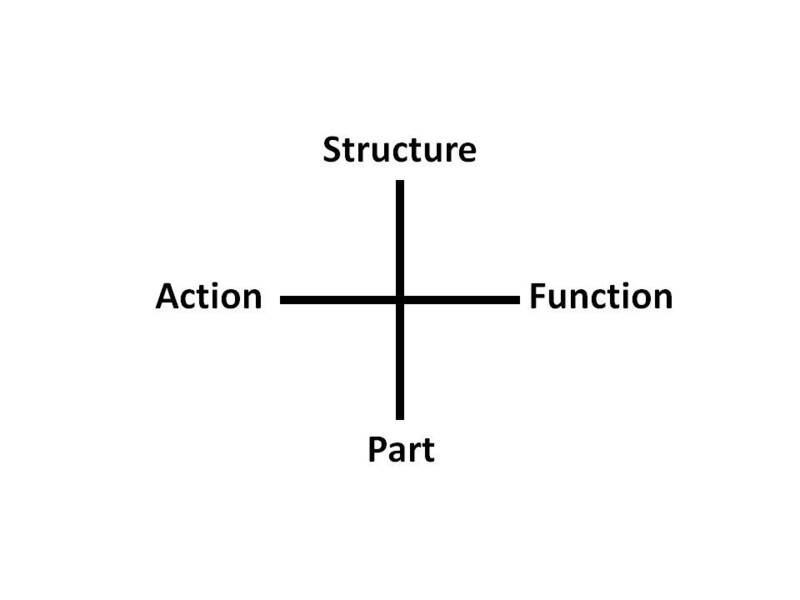 Ideally structure is an arrangement of parts in space. However, in this conceptualization, structure will be only an unordered list of parts with duplications allowed. Last, instead of final cause we will say function, but not simply the function of the thing as determined by humans. Ordinarily function is not a mere list of actions, or a set of actions, or a sum or integral of actions, but an ordered aggregate of actions that enables a functionality. Ideally function is an arrangement of actions in time. However, like structure, function will be only an unordered list of actions with duplications allowed. As we transform the Four Causes from made things to all things, both natural and human-made, we will later examine how that changes them.